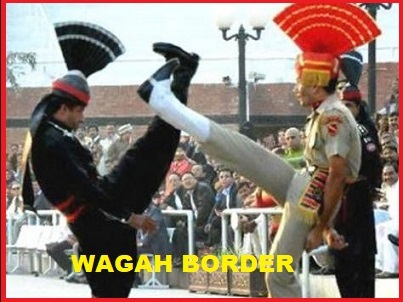 Wagah Border is an important place & tourist attraction located between India and Pakistan. Wagah, a village situated on the Grand Trunk Road between India's Amritsar and Lahore in Pakistan. The Wagah border is situated at a distance of 29 km. from Lahore (Pakistan) and 27 km. from Amritsar (India). Radcliffe Line which had been drawn during 1947 partition, it splits India and Pakistan which passes through the village Wagah on the Indian side. Wagah Border Flag Ceremony, also known as 'Beating Retreat Ceremony', was first started in 1959 with an objective to create an atmosphere of mutual cooperation and harmony between the two countries. The main aim of "Wagah Border Ceremony" is to formally close the border for the night and take-off the National Flag of both nations. The Flag Lowering Ceremony is done daily before sunset. However, this is an entertainment ceremony but displayed as patriotic performance every day. Wagah Border Ceremony is an event for great tourist attraction. During this, National Anthem is played, slogans of patriotism and dance are also performed. At the time of this retreat event, the border looks like a battleground, as the procession is conducted with loud shouts and heavy foot stomping by the soldiers. A form of marching where soldiers lift up their legs very high is known as “Goose Marching”. This procession continues for 45 minutes.